The tents are called ittaq. They are very warm, especially when the sun is shining. They have one stove.The floors are scrubbed.The back part has fur on the outside in order to keep the rain out because this is the bed part.The tents can be moved easily and usually follow them to the hunt. 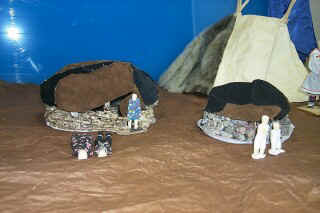 The sod houses are more permanent. The tents have three poles in the back and two in the front. 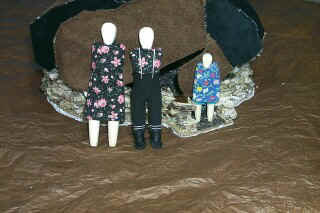 Rocks are put around the tents to keep them steady, but this is optional because they come in different sizes and styles. Used in the summer and winter - it is usually made of rocks and sods. The sides are usually covered with mud because this helps to keep them warm. 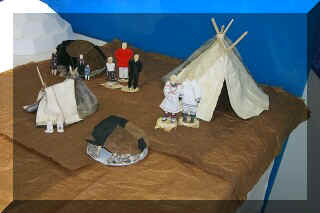 Inside it is covered with seal skin. 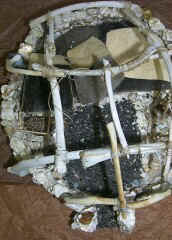 The top is made of seal skin. 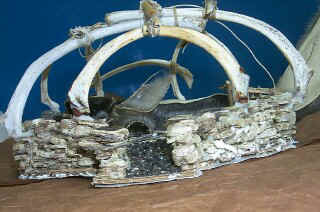 The frame is made of whale ribs and/or wood. They were usually used in a village concept. 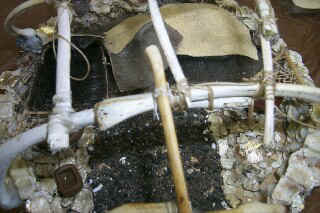 A window, made of seal intestine, was inserted into the front. 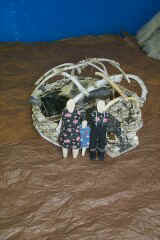 Rope or baleen rope was used to tie the whale bones to keep them in place. The floor is made of rocks. 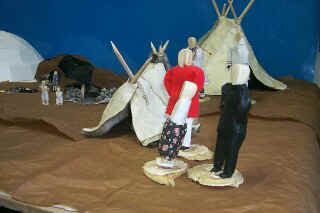 Earth is put into the area where the beds are to be placed and then covered with caribou skin. There are usually three stoves. There are three in order to keep them warm. There is one little one used to keep it light. They are called quilliq. 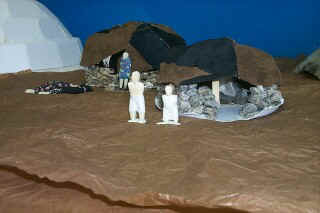 This village would be used over and over, but the sod house would be rebuilt in the following year. They would use it from April to October. This is modern day clothing and is made from material that is common across other parts of the world. The modern dress calls for more sweaters and under clothes than in the past. These wooden dolls were the most common toys for the girls and often for boys, They would pretend to be husband and wives with children and other members of the family. The father and the younger brothers' wives would pretend to be sisters-in-law and their children would pretend to be nephews and they would really pretend to play as the actual family life. They would pretend to live in different villages and they would pretend to go and get wives from other villages. They would also pretend to have White men come into their villages and they would also pretend to have to leave to go to hospitals. They would also pretend to have women be pregnant and they would also pretend to deliver the women's babies. 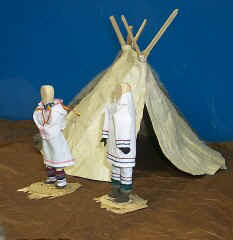 They would pretend to go out on the land and pretend to be stuck and then they would get hungry and they would also pretend to go and buy food and pretend to hunt animals. They would pretend to tell their children what to do to help them. They would pretend to worry about the clothing their children or their families would need. 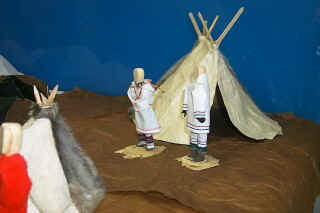 These dolls are used in this presentation to illustrate the type of clothing worn by the Inuit during the different seasons. The dolls in front of both types of houses. 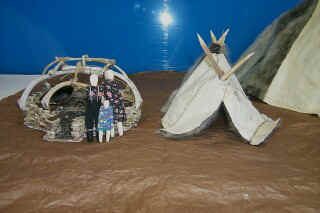 There is incredible detail in the interior of these sod huts that these pictures do no do justice to. See additional pictures below. If you would like to make a comment on our project, just click on the Icon above.